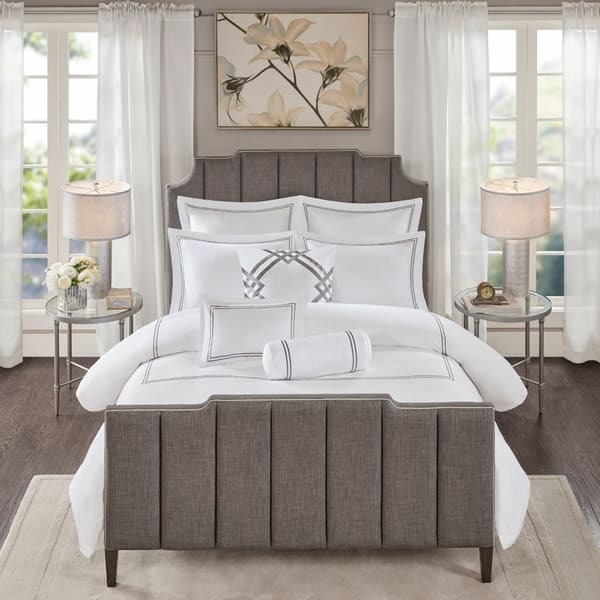 This set is vibrant white and looks fantastic on our new white/gray bed that we just purchased for our guest room. It didn’t come with sheets which is a bummer, but we were able to find some that we liked on overstock and purchased them. The comforter is a perfect thickness, not too heavy, not too light, and the throw pillows are a nice touch. All in all we are very pleased with this purchase and highly recommend this to others. Don’t hesitate based on price with Overstock, we are becoming more and more frequent purchasers!! Transform your bedroom with the modern elegance of Madison Park Signature's Hotel 101 Comforter Set. This 100-percent cotton, duvet style comforter set features grey satin stitched embroidery on the white base fabric that creates a clean, elevated hotel aesthetic. The two shams and two Euro shams match the design of the comforter with embroidered satin stitched borders and beautiful flanges, for a chic coordinated look. Three decorative pillows are also included to provide the perfect finishing touches to the bedding set. The oblong and bolster pillows flaunt exquisite embroidery, while the square pillow offers a bold look with a rich geometric design. Oversized and overfilled, this contemporary comforter set is made from 400 thread count cotton sateen for a luxuriously soft feel and is machine washable for easy care. The comforter comes with a removable insert and decorative buttons for a secure fastening. Best comforter set I’ve ever bought. Flawless. Extremely soft and well made. Loved the color & design on the comforter! Absolutely stunning! My bedroom looks and feels like a plush hotel. The fabric is very soft and comfortable. Love it! Top Quality! The material is high end quality without a doubt. The only thing to be cautioned is that this is a duvet cover with a comforter - two separate items. If you don't mind paying the price i guarantee you will not regret this purchase - I just love it! I love love love this set. I actually got his set cheaper here than the "other" home good website. this will sure make my room look luxurious! Very happy with this choice! high quality, looks very elegant! Extremely solid purchase. Attractive, well made, easily assembled. Color is as described. This order arrived on time and without defect. So nice and soft. Looks beautiful. Washes well. One for its classic look, second because it is cotton with a high thread count and finally the reviews were all ver positive!